Classic Nicrete bricks offer a fresh and clean textured finish that is unsurpassed when it comes to color selection, size, durability and aesthetics. The Nicrete Thin Series was developed for ease of renovations and transforming an existing wall, such as a fireplace or for other interior applications, and can be applied with an adhesive in a track style. Traditional Nicrete brick offers a smooth, matte finish that includes crisp, square edges. This design ensures clean lay lines and a snug fit. Our Guilford stone Nicrete brick is a versatile and economical alternative to cut stone. We are a dealer for many different popular lines of clay brick sold nation wide. Our ceramic fire brick is manufactured to withstand extremely high temperatures, which makes this product ideal for fireplace lining, kilns, furnaces, fireboxes and anywhere else you might expect extreme temperatures. We developed our Nicrete Thin Series for ease of renovations and transforming an existing wall, such as a fireplace or for other interior applications, and can be applied with an adhesive in a track style. We offer ceramic fire brick to withstand extremely high temperatures, which makes this product ideal for fireplace lining, kilns, furnaces, fireboxes and anywhere else you might expect extreme temperatures. We are a dealer for many different popular lines of clay brick products sold nationwide. Our Guilford stone Nicrete brick is a versatile and economical alternative to clay brick and offers a look similar to cut stone. Colonial Nicrete brick from Nitterhouse offers a slightly textured surface finish, as well as smooth, rounded edges that produce an antique look, as compared to our traditional Nicrete brick. People have used brick in their construction and landscaping applications for thousands of years. Construction workers around the world still use brick in a wide range of uses today. Structural uses — From historic buildings to modern homes, masonry is a staple in both commercial and residential building construction. Brick for storefronts also creates a polished, professional look. Brick walls have a reputation for providing a stable and long-lasting foundation, composing some of the most beautiful buildings in the world. The brick can either be concealed on the inside by another finished material like plaster or paint or can be exposed on both the interior and exterior for a traditional and elegant style. While less common, brick has also traditionally been used to construct the roofs and floors of some buildings. Decorative uses — The elegance and simplicity of brick make it an exceptional choice for decorative use. It comes in many beautiful colors and textures for a variety of aesthetic designs. Many high-end homes use masonry to line driveways and patios, and both residential and commercial buildings often use brick that’s cast to form arches, cornices and other decorative designs. Fire-resistant uses — For centuries, people have used fire bricks to build fireplaces and chimneys due to their exceptional temperature tolerance. The material is noncombustible, making it an excellent choice for withstanding a fireplace’s heat. Any siding option can be beautiful and budget-friendly, but brick offers several unique advantages over other popular construction choices like stucco and vinyl siding. 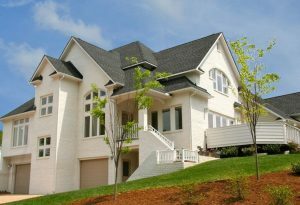 Many contractors agree stucco is a good short-term investment, but the long-term benefits of brick make it the most worthwhile choice in many construction applications. As one of the oldest construction materials in the world, brick offers superior longevity over stucco — which onlylasts between 50 to 100 years before needing to be replaced. As a brittle material, stucco will also need far more frequent maintenance. Similarly, many experts choose brick over vinyl siding due to brick’s increased longevity and little need for maintenance. Brick offers superior durability in cold climates as compared to vinyl, which often cracks and breaks in severe weather and dents in windy conditions. Further, as a non-combustible material, brick is also far safer in fire-prone areas — experiments from the National Institute of Standards and Technology found a house with vinyl siding might ignite as a result of a fire inside an adjacent home six feet away in less than five minutes. Brick has an extraordinarily long life expectancy, making it one of the most popular choices in building construction. In fact, according to the National Association of Home Builders, masonry is one of the home’s most durable elements and can last more than 100 years with proper care. In many instances, brick has even maintained its integrity for hundreds of years beyond its life expectancy with little extra maintenance. Masonry can withstand a high load-bearing capacity throughout its lifetime with little noticeable wear and tear. Unlike other construction materials, it won’t rust, peel, tarnish, rot or erode. This durability contributes to its long lifespan. Clay and concrete masonry offer natural thermal qualities that absorb heat and slowly release it at a later time. During the summer, brick helps to keep a building cool during the warm part of the day, while during the winter, it absorbs heat energy in the air to radiate to the interior. Combined with insulation, this is a highly energy-efficient solution that can save home and business owners money over time, since they have less need to run air conditioners or heating devices throughout the year. The U.S. Department of Energy even outlines brick as one of the most common thermal mass elements in passive solar home design. Masonry is famous for its environmental friendliness and sustainability, making it one of the best building options for anyone looking to go green. Constructed from some of the most readily available organic materials on earth, brick doesn’t use up valuable non-renewable resources during its construction. It’s also non-toxic and won’t produce much environmental pollution during manufacturing, and its long lifespan and energy efficiency ensure ongoing green benefits throughout its lifetime. Fire brick is noncombustible — which makes it a popular choice for use around fireplaces — but its excellent thermal properties also make it an exceptional option for buildings in areas prone to wildfires. The Federal Emergency Management Agency lists masonry as one of the best exterior wall materials for home builders constructing in wildfire zones due to its fire resistance. The material can withstand these extreme levels of heat because each brick gets fired to temperatures above 1,800 degrees Fahrenheit during production. It’s so well-known for its ability to withstand brush fire that some insurance companies even offer discounts for brick-made homes and businesses. Along with its resistance to fire, brick structures are also excellent at protecting those inside from wind and rain. While not completely waterproof, brick and brick veneer walls can control moisture better than other external materials. Not only does this water resistance effectively protect the building and its inhabitants from the elements, but it also ensures little damage due to mold or corrosion. Likewise, brick offers far more protection from wind-blown debris than vinyl siding or similar materials. It exceeds Florida’s impact resistance requirements for facilities in hurricane-prone areas and is the material of choice for builders in wind-prone regions around the world. Bricklaying is not inherently expensive like many other construction materials. And, unlike with timber constructions, brick installers can do their work directly on site, which means fewer trips to transport materials and less money spent on installation. But not only is brick more cost-effective during installation, but it also reduces a building’s cost throughout its entire lifetime. Because the material won’t rust, warp, peel or undergo other adverse reactions over time, brick needs little to no maintenance throughout its lifecycle. It won’t require painting to maintain its aesthetic appeal, nor will it need to be sealed or protected from pests. You’ll likely only need to clean your brick structure every so often with a soft brush to maintain its looks. Because it won’t require expensive maintenance, you’ll discover your brick structure has an exceptional return on investment. Many home and business owners opt for a brick building for a straightforward reason — brick is beautiful. Traditional brick has graced the exteriors of stylish homes, splendid mansions and classic storefronts for generations, while non-traditional bricks provide an unbeatable sleek, modern aesthetic. Many distinctive colors and styles are available to meet the needs of many applications. At Nitterhouse Masonry Products, we offer an array of color options in each of our Nicrete product lines. Whether you’re searching for a traditional look, white concrete bricks or something more out of the ordinary such as bricks that look like stone, you’ll be able to find an available color and style suited to your unique application. Likewise, you can choose from several texture options, including smooth, matte surfaces or textured bricks that add a decorative layer to an otherwise dull building. With so many different designs at your fingertips, you’re sure to find something that will enhance the aesthetic appeal of your project. If you’re looking to take advantage of these unique advantages for your next construction application, you might be wondering how many bricks you’ll need to purchase. The number of bricks you’ll need for your project depends on your project area’s square footage. After you find the square footage, use the following calculation to determine how many bricks you’ll likely need. Don’t forget to include a percentage of overages in case of an error or breakage — many professionals add between 5 and 10 percent to the square footage to account for these situations. Measure the length and height of one brick — or length and width if you will be getting your bricks installed with the broad face up, as with patio pavers — and multiply the two numbers together to get its total square inches. Then, divide the number of square inches into 144 — the number of square inches in a square foot. The result will help you determine how many bricks you’ll need per square foot. For example, say the brick you’re using to build a wall is eight inches long by three inches tall. Multiply eight and three to get 24. Then divide 144 by 24 to get six, which is the number of bricks you’ll need per square foot. Once you know how many bricks you’ll need per square foot, determine how many bricks you’ll need for the whole job by multiplying the square footage of your project area by the number of bricks you’ll need per square foot, which you calculated using the formula above. Let’s use the above example and say that you want to build a wall that’s 10 feet tall and 10 feet wide — or 100 square feet. Multiply 100 by the six bricks you need per square foot to get 600 — the number of bricks you’ll need for your entire application. However, remember to purchase more bricks than necessary in case of damage or error. If you’re interested in buying our premium-quality concrete or clay bricks, you don’t have to look far. We have an extensive network of Nitterhouse Masonry Products dealers throughout the East Coast and beyond who will provide you with everything you need for success in your construction or landscaping applications. We’re proud to offer services in Delaware, New York, New Jersey, Ohio, Pennsylvania and more. View our “Locate a Dealer” map to find a dealer near you who offers clay or concrete brick products. At Nitterhouse Masonry Products, we emphasize quality in everything we do, from the products we manufacture to the customer service we provide. That means focusing on the quality and integrity of each individual brick as it travels through the manufacturing process. This commitment to quality shines through in your project, as you use brick that meets the highest standard to achieve outstanding results at your home or for your own clients. Nitterhouse brick finds use in projects of all scopes and applications. It performs under pressure and over the long term, thanks to the quality we’re committed to as a brick supplier for end users who are also committed to quality. Our founder, William L. Nitterhouse, first started the company by manufacturing his own blocks at night after laying blocks and bricks all day. He thought he could improve upon the processes and customer service competing masonry suppliers were providing at that time. His emphasis on meeting the highest standard in quality products and outstanding customer service helped his business grow into a regional block and brick supplier, and these characteristics are what still drive us today. Brick is an incredibly useful tool in a wide range of construction applications. If you’re ready to transform your next construction project using clay brick products or our innovative line of concrete brick products, we’ll be glad to help. Please browse our selection of bricks for sale in the categories above, then contact us online or call us for more information.